Shoulder Dislocations and Instability Handout | Dr. Thomas Trumble, M.D. After a fall or twisting injury the shoulder can dislocate either completely or partially (subluxations). These tears occurs because of a tear in the capsule that can result in more dislocations with even every day activities or with the apprehension that the shoulder is unstable with even routine activities. Often the patients with shoulder instability are pain free at rest but even minor activities result in the uneasy feeling that the shoulder can or will dislocate. 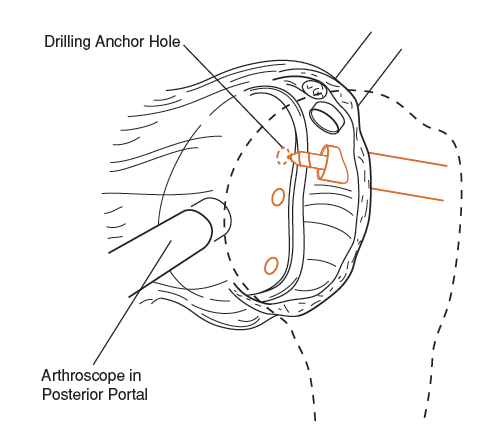 The shoulder is stabilized by a balance of muscles plus a thick capsule that is call the labrum when it attaches to the bone of the glenoid that forms the socket of this modified ball and socket type of joint (Figure 1). 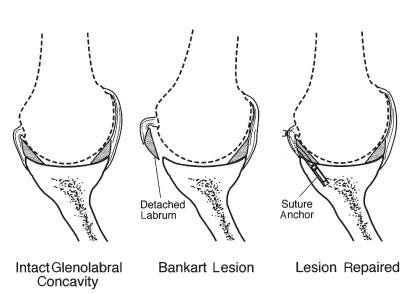 The ligament detachment from the glenoid is called a Bankart lesion. Shoulder dislocations can occur after a fall or during sports injuries. Some sports with a great deal of shoulder motion and stress such as weight lifting a or swimming can produce shoulder instability without a specific injury. How do we diagnose Shoulder Instability? On clinical exam the patients demonstrate a positive ‘apprehension test’ where the motion of reaching behind the head or a throwing motion produces the sensation that the shoulder could become unstable. X-­‐rays are frequently negative but MRI (magnetic resonance imaging) is an excellent test to identify Bankart tears where the capsule is seen to separate from the bone. The patients are seen by a physical therapist two to three days after surgery. After surgery, patients are placed in a splint or brace that prevents rotation of the shoulder that could stress the repair. They also begin a therapy program that works to increase range of motion without affecting the surgical repair. Although patients do regain most of their motion by three months, full recovery may not occur for over one year.